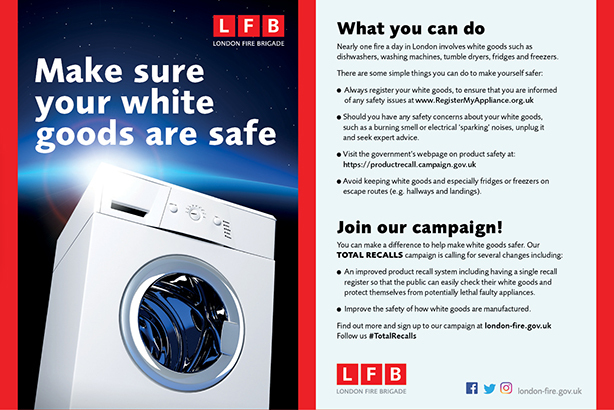 The campaign arose after LFB analysed data from fires in the home involving white goods such as tumble dryers, fridges and freezers, and found that call-outs to these types of incident were the equivalent of one a day. Further analysis revealed that, where there was an electrical cause for the fire starting, 90 per cent were caused by faults intrinsic to the equipment, rather than how they were used. This was a major concern for the fire service because some electrical appliances are run constantly, including when householders are asleep, making them more vulnerable to harm if a fire were to start. LFB’s response was to launch a campaign in 2016 lobbying the government and manufacturers to implement changes that made it easier for the public to protect themselves. It called for a single product-recall database to make it easier for members of the public to find out whether their white goods were faulty and for manufacturers to take appropriate action and make improvements in the standards of the appliances. Helen Newton, LFB’s public affairs manager, set out to persuade the government and MPs of the need to change the existing recall system and create a single, publicly accessible, register for UK product recalls, as well as the publication of risk assessments if a fault was found in a particular product. The brigade also wanted international recalls to be included on the register and for recalls to be better publicised, to inform the public, as well as better regulation of second-hand appliances. LFB called for changes to the way fridges and freezers are manufactured to reduce fire risk, and for all appliances to be marked with a model and serial number, making them easier to track. It also called for the fact that people could be sleeping when a fire started to be included in risk assessments. A second objective was to target manufacturers and ask them to take more action to help keep their customers safe. LFB wrote to Whirlpool in February 2016 asking the company to change its safety notices to consumers where one of its appliances had developed a fault to warn them not to continue to use the product unattended, for example when they were asleep or out of the house; Whirlpool refused. It was also important for the fire brigade to raise awareness of the dangers of faulty white goods with the public. It deployed a comms campaign with key safety messages, such as to unplug and seek expert advice if a device was making electrical sparking noises, or giving off a burning smell. The campaign also told people to avoid putting appliances in the way of escape routes from their home. The strategy for the campaign focused on the scale of the problem – that fire fighters were attending an average of one fire a day in London involving white goods – to resonate with the public, government and other stakeholders. Not long after LFB began to lobby the government’s consumer minister, then Anna Soubry MP and later Margot James MP, a high-profile incident at Shepherds Court in West London, involving a a tumble dryer which was subject to corrective action by the manufacturer, served to illustrate the need for urgent changes. The fire, in August 2016, engulfed three floors of the tower block and it took more than 100 fire fighters to bring it under control, generating national media coverage in the process and highlighting the problem. Thankfully, nobody was killed or seriously injured in the blaze, although 50 people had to be evacuated and one person was treated for smoke inhalation. LFB’s investigation into the fire found that the appliance was subject to corrective action, butthe advice to consumers by the manufacturer was that they could continue to use it if not left unattended. In addition to lobbying the minister for consumers directly, LFB targeted MPs, including those working on fire safety issues, across the political spectrum to get them to raise the issue in parliament or propagate the campaign demands where there had been fires involving white goods in their constituencies. 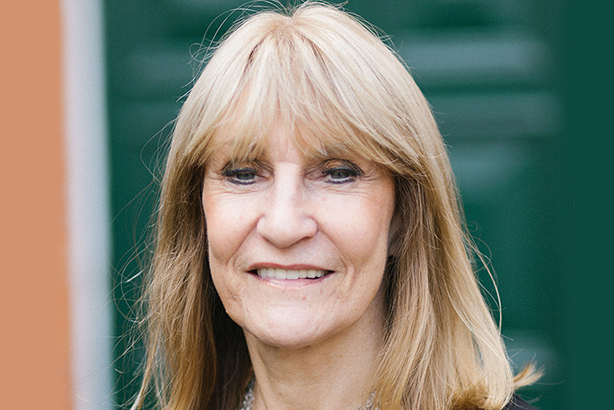 The government had previously asked journalist and consumer champion Lynn Faulds Wood (pictured) to conduct a review of product safety in 2015, to inform future regulation. As the campaign gathered pace in 2016, lobbying by the fire service led the minister for consumers to create a strengthened parliamentary working group – and to include LFB in it – to consider Faulds Wood’s recommendations. 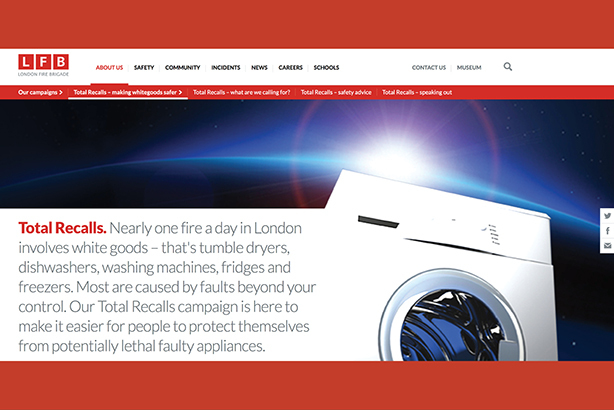 LFB used the first anniversary of the Shepherds Court fire in August 2017, and other high-profile incidents, as a hook to illustrate the need for urgent action on faulty appliances. On the anniversary of Shepherds Court, LFB published an open letter addressed to the Prime Minister, Theresa May, expressing concern that people were still using white goods that posed a serious fire risk because they were subject to recall or corrective action. The letter, signed by the London Fire Commissioner, the Mayor of London and the National Fire Chiefs Council, received media attention and led to commitments from the Prime Minister to take action. 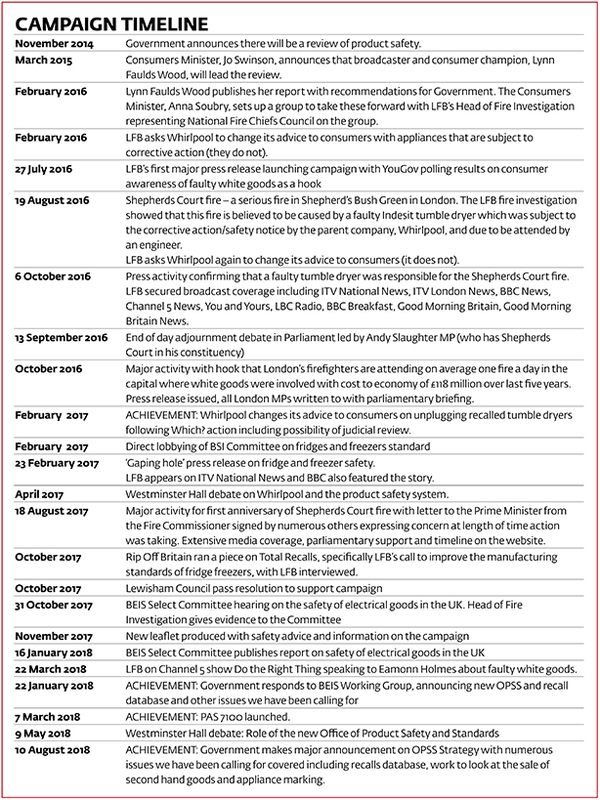 A digital dimension to the campaign on LFB’s website used an interactive timeline to show the length of time since the government announced a review of product safety, in November 2014, and the reports and recommendations which had followed, without concrete action. As LFB’s lobbying activity gathered pace, it crystallised the consumer-facing elements of the campaign into ‘Total Recalls’, a title alluding to the 1990 Arnold Schwarzenegger sci-fi film Total Recall. The low-cost campaign used only staff resources and only spent money on a YouGov survey of Londoners to gauge whether consumers understood the risks of faulty white goods. The fire service worked closely with several partners to increase its chances of achieving change, including Which?, the Consumers' Association's campaigning organisation. LFB said working with Which? helped it reach a wider audience via its membership base of more than 100,000 people. Crucially, Which? began the first stages of a judicial review into the decision by Peterborough Council trading standards team to not investigate Whirlpool and its decision to ignore the LFB's request to change its advice to consumers. LFB said the threat of this action led to the manufacturer capitulating to its demands. To give its work further national reach, LFB also worked with the charity Electrical Safety First, which had access to a wider range of MPs. It also worked with the National Fire Chiefs Council and the Fire Brigades Union to garner the support from fire and rescue services across the UK and further amplify the campaign aims. The campaign was not measured in terms of website hits or social-media interactions because its main thrust was to drive government action on the safety of appliances. Instead, the fire service assessed commitments to take action and announcements by government to implement recommendations. LFB also used the raft of media coverage over the lifetime of the campaign to gauge how seriously it was being taken. Another measurement was the number of MPs, from every political party, who took action by raising the issue in parliament or on behalf of constituents. The crucial measure of success in every campaign are the outcomes, and LFB chalked up several significant, and permanent, improvements. In January 2018, the government announced a new Office for Product Safety and Standards. Part of its remit would be to develop and maintain 'a comprehensive database' of recalled consumer goods, a key aim of the campaign. The government also agreed to look at solutions to improve the marking of white goods with serial numbers to help identify them properly after a fire. Then, in March 2018, the Department for Business, Energy and Industrial Strategy (BEIS) published new guidance for businesses on what they should do if something goes wrong. The new Code of Practice (PAS 7100) was developed in conjunction with the Office for Product Safety and Standards and BSI, the national standards body, following a key recommendation by the Working Group on Product Recalls and Safety. As part of the new code, businesses had to prepare a list of the organisations and individuals that may need to be contacted in case of a product recall. They must also ensure that they have a media plan, with a nominated person responsible for it, and that announcements are clear and easily understood. LFB said the government has now committed to creating a database of all recalled goods, for public use, by the end of 2019. The fire brigade said that the next step in its campaign will be to make sure that consumers are aware of its existence and to use it to check whether any of their white goods are subject to recall. LFB is also pushing for greater regulation of second-hand appliances and changes to the way fridges and freezers are manufactured to reduce the risk of accidental fires, as well as to include people sleeping as a factor in future risk assessments. Commenting on the campaign, Newton told PRWeek: "There was an alarming number of fires involving white goods, but it was virtually impossible for people to check whether they had a potentially deadly appliance in their home. "As the UK’s busiest fire and rescue service we were in a unique position to demonstrate how serious these fires could be. By developing a set of specific changes that would make it easier for people to take action to keep themselves safe, we have been able to persuade the government of the case for improving the system, while also enabling us to push for manufacturing standards to be improved to make these products safer in the first place."